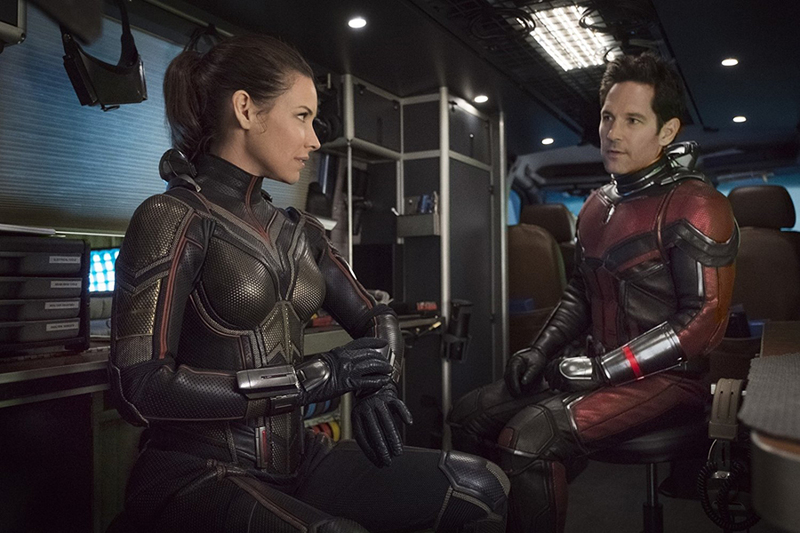 Paul Rudd and Evangeline Lilly in ANT-MAN AND THE WASP. Courtesy of Marvel Studios. One of the best things about director Peyton Reed’s ANT-MAN AND THE WASP is how the sequel handles its characters. From the fan-favorites in the supporting cast, to the much beloved leads, characters are caught in a metamorphosis. Their own personal arcs are deepening, but they’re also shifting within the context of the MCU, now in another stage from where ANT-MAN began. Reed’s sequel has our well-adored hero Ant-Man/ Scott Lang (Paul Rudd) struggling with the restlessness of his final days on probation. It’s, of course, during this time where Hank Pym (Michael Douglas) and Hope Van Dyne (Evangeline Lilly) need him to return to service to help them locate the long-missing Janet Van Dyne (Michelle Pfeiffer), who’s been trapped in deep in the Quantum Realm for decades. 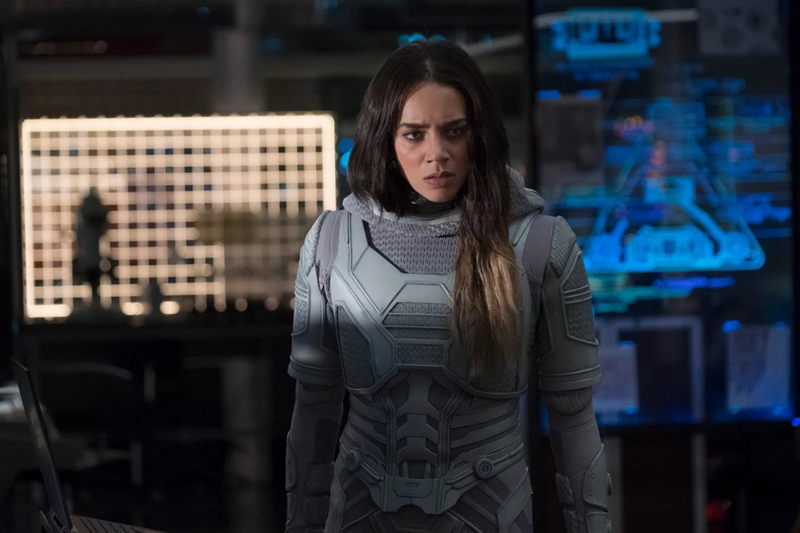 However, a mysterious Ghost (Hannah John-Kamen), is in desperate need of this technology – and would do anything to get at it. This marvel-ous movie acts not only as a direct sequel to the 2015 origin story, but also a sequel to CAPTAIN AMERICA: CIVIL WAR, where we saw Scott violate the terms of the Sokovia Accords, fighting other superheroes at an abandoned airport. At the film’s recent Los Angeles press conference, Reed said they thought a lot about this story in these explicit terms. What was cool about CAPTAIN AMERICA: CIVIL WAR is we could not ignore what had happened to Scott Lang in that movie, in this movie. It gave us an organic jumping off point, because my first reaction was, “What would Hank Pym and Hope Van Dyne think about Scott taking the suit and getting involved with this and fighting with the Avengers?” Well, they’d be pissed off. It really gave us a really natural starting point from the get go. Rudd valued being able to write from an already formed character’s perspective. One of the things that was kind of nice is it gave us, I felt, a little bit of leeway, to lean into something maybe a little harder than we would have been able to at first, because now the character has been established and we’ve seen Scott in two other films. People buy the abilities. They buy me in the role. They understand the rules. People know who this guy is already. So it felt as if we had a little bit more freedom to play into the humor. Whereas the first time around we were still modulating. Instead of calling this second chapter simply ANT-MAN 2, Marvel wisely gave Wasp equal billing. President of Marvel Studios, Kevin Feige, said that was always going to be the plan. That was the first idea with the movie before even CIVIL WAR. The first ANT-MAN film essentially is all about how qualified Hope is and her estrangement from her father, who’s preventing her from doing these things. It was without question. We always knew that the next one was going to be ANT-MAN AND THE WASP and that it would finally be time to see her suit up and be the hero. Lilly added that her fully-suited character was supposed to make an appearance in CIVIL WAR, but that creative decision was nixed when they chose to save that big moment for this film. Wasp was going to be introduced in CIVIL WAR; that was the original plan. Secretly I was like… hmm. Then when I got a call saying, “We’ve decided not to put you in CIVIL WAR,” there was this moment, I could tell where the feeling in the room was “Don’t be offended.” And I was like, “No-no-no. Are they going to say what I think they’re going to say?” And then they said what I thought they were going to say, which was, “Because we really want to dedicate a film to introducing this female superhero and we don’t want her just to be a side note in this larger story.” That was so exciting for me. I still didn’t know that there was going to be double billing. That didn’t come till later and that was presented to me as a surprise, by email with a screen cap of the title and so that was pretty cool. Hannah John-Kamen in ANT-MAN AND THE WASP. Courtesy of Marvel Studios. In addition to the equality presented, the role of the villain is also changing. John-Kamen stated there was nothing traditional about her role as the villain and how she approached playing her. I definitely approach the character not as a villain at all. Definitely a threat to the characters and the heroes of the movie. But when you play a villain, you have to play it like you’re the good guy and everyone else is bad. The stakes are so high, she has such a clear objective in the movie. I think with the villains, what Marvel Universe do so well is, is it’s not black and white. It’s very gray, you know, and I think the villains are very redeemable and because they’re fun and you want to see them again. Lilly chimed in, stating that lesson on redemption is part of what she teaches her seven-year-old son. When he talks about good guys and bad guys in movies, I always feel a responsibility to clarify for him, “Honey you know that there really is no such thing as a bad guy, right? They’re only just good guys, who have made so many bad choices, they’ve forgotten how to make good choices. A true hero’s job is to remind them of their goodness – not to annihilate them, to kill them. It’s to help them redeem themselves.” Superhero stories are fun and they’re a totally different world, but what I think is cool and is that to have redeemable villains, you’re teaching children that if you encounter somebody that might have a different opinion than you, that doesn’t mean they’re a villain. If they have a different objective than you, it doesn’t mean you should attack them. Maybe you want to try to understand them first. I’d never done a sequel before. One of the things I like in sequels is progressing the characters. In looking at the characters of Luis and Kurt and Dave, the ex-con guys, in the first movie, they’re ex-cons and they’re really trying to stay out of a life of crime. They discover what it feels like to be a hero. In this thing, it really felt like [we needed to] start them from a place where they’re on the straight and narrow now. They’re trying to start a small business. I like the idea that this movie would have huge personal stakes, but also the success of their business also has huge stakes. In terms of the Luis storytelling, that’s always a fun thing to shoot and what we do basically is we shoot Michael telling the whole story. I’ll cut together the preferred takes and do basically what we call a “radio cut.” For example, if it’s Paul or Evangeline’s turn to do their lip syncing, we’ll take that little section on set, play it over and over through speakers so they can hear it and then just go at it multiple times, until we get a performance in it and something that syncs. It was fun for me to do. ANT-MAN AND THE WASP opens on July 6. Read our review here. Win a copy of ‘I FEEL PRETTY’ on Blu-ray!